You can already order our daffodil bulbs, these will be delivered in October as soon as it is time to plant them. Due to different delivery times, dahlia tubers and daffodil bulbs cannot be combined in 1 order. Daffodil bulbs are very easy and rewarding spring flowering plants that, just like perennials, return automatically every year. Give them a sunny spot and you can enjoy them again every spring. Flowering daffodils are often the first sign of spring. Those who think daffodils are only yellow, are wrong. There are daffodils in white, cream and with a pink or orange trumpet. There are single and double daffodils. Some daffodil species remain low and give small flowers and others are longer and give very large flowers. From most daffodil bulbs grow several flowers that spread a wonderful scent. So joyfull! When to plant daffodils bulbs? Daffodil bulbs need a period of cold first to be able to bloom. So plant them in the autumn in the months of October, November or December. 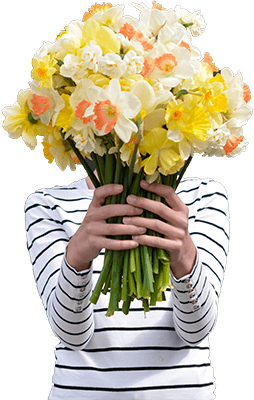 You will receive large size bulbs from us so you can expect beautiful bold flowers. Daffodils bloom in the spring, you will smell it! Daffodil bulbs, how to plant? Daffodil bulbs do not like wet feet, so make sure the soil is well drained. Loosen the soil a bit and plant the daffodil bulbs with the tip up. Put some ground over it, press down slightly and done. You can spread narcissus bulbs through the garden for a natural effect or make large groups in beds or plant pots. Of course, we supply an extensive plant instruction with our flower bulbs. Daffodil bulbs need little care. If it is dry, water regularly. When they are finished, the leaves become yellow, then the bulbs will develop. Only when the crop has died can you cut off or discard the leaves. In the winter you can simply leave the daffodil bulbs in the ground, cover them with some leaves from the garden. - How do I plant daffodil bulbs? - Can I plant daffodil bulbs in pots? - Can I mix daffodils with other flowers in a vase? If you follow us on Instagram or Facebook you can follow the story of our daffodil bulbs, our nursery and the seasons. Enjoy the beautiful flower fields. We also provide handy garden tips and highlight special varieties. On Pinterest you can easily view all the beautiful daffodil photos and pin them on your own board.